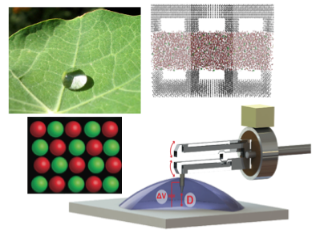 My research is at the interface between soft condensed matter, hydrodynamics and nano-science. It is mostly curiosity driven. 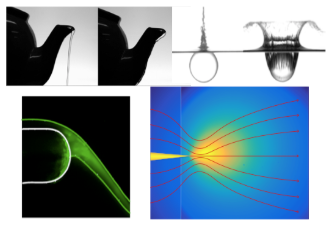 We combine experiments, theory, and molecular simulations to explore the intimate mechanisms of the dynamics of fluid interfaces from the macroscopic down to the molecular level, with applications in the fields of micro- and nano- fluidics, large scale hydrodynamics, material science, complex fluids, etc. My recent research interest is to take benefit of the unexpected fluid transport behavior occurring at the nanoscales to propose new routes for energy harvesting and desalination. New paradigms for fluid transport are expected to emerge from the confinement of liquids at the nanoscales, which is the domain of nanofluidics, with potential breakthroughs in ultrafiltration, desalination, and energy harvesting. 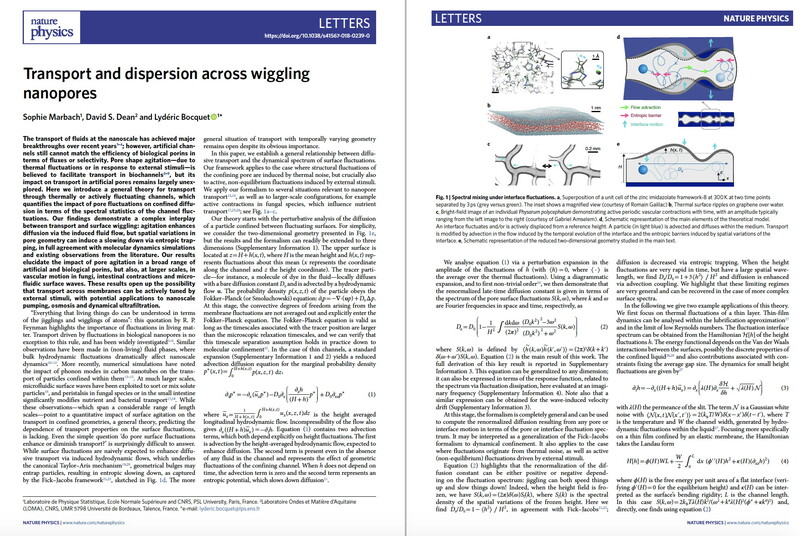 Nevertheless, advancing the fundamental understanding of fluid transport at the smallest scales requires mass and ion dynamics to be ultimately characterized across an individual channel so to avoid averaging over many pores. To this aim, we have developped various nanofluidic plateforms using nanomanipulation methods, and allowing to investigate the properties of individual nanotubes. 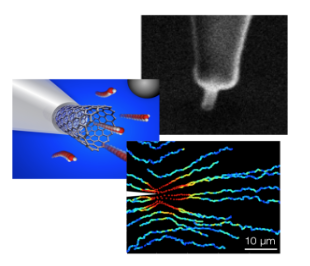 Among results, we have demonstrated giant osmotic energy conversion in BNNT nanotubes, as well as a diameter dependent giant slippage in carbon nanotubes. 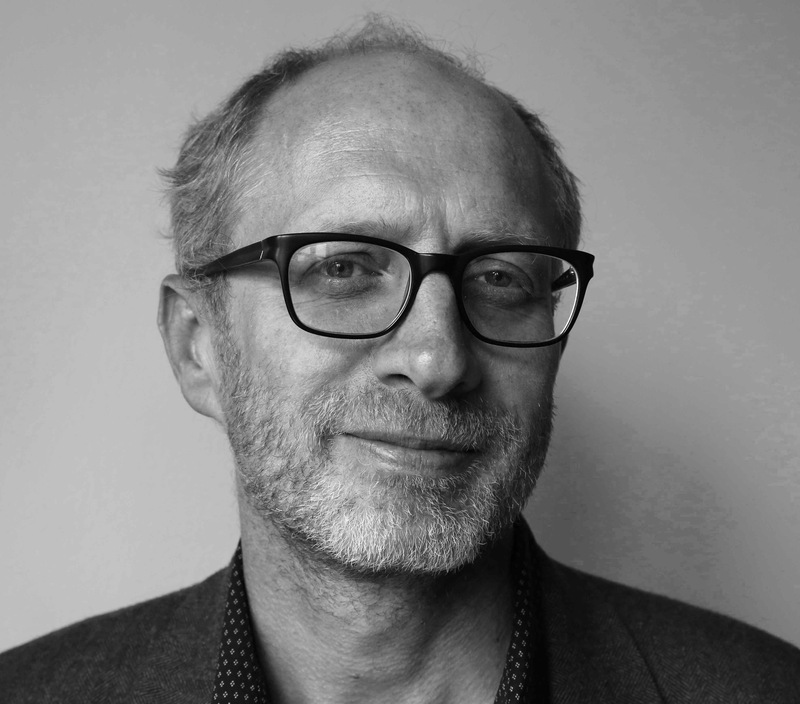 We now explore active nanofluidics, with the aim to boost and control transport at the ultimate scales, in the quest to design ionic machines. We have explored how interfaces modify the statics and dynamics of liquids, both theoretically and experimentally. We have studied Liquid-solid friction and the question of hydrodynamic slippage at the molecular scales, on bare and super-hydrophobic surfaces. 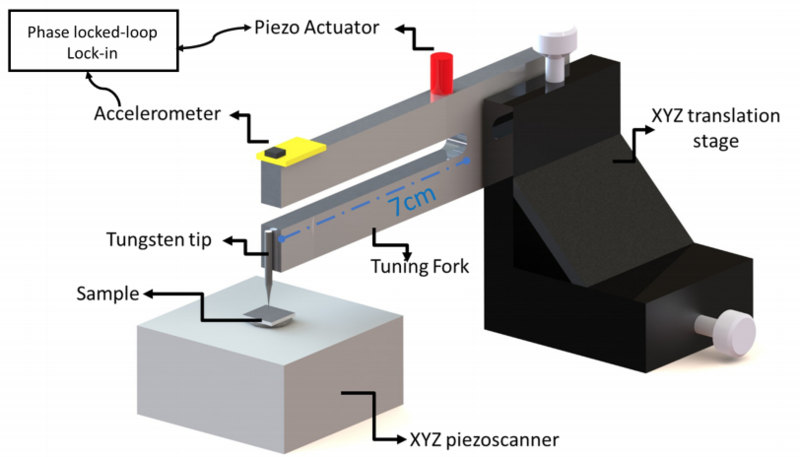 Thanks to Tuning Fork AFM, we have evidenced a capillary freezing of ionic liquids in the presence of metallic surfaces, pointing to the role of electronic screening effects in Soft Matter. Opposite to the exploration of smaller and smaller length scales in fluids, we have followed a reverse, bottom-up approach for fluid dynamics: may one impact macroscopic flows via nanometric details, coupling the small and the large ? While such effects are not a priori expected due to a huge difference in energy scales, we have demonstrated in several situations that such a link was indeed possible, eg during the impact of a solid body on a liquid surface (splash or plop), as well as for flow separation on solid surfaces, usually coined as the teapot effect. In both cases, we shown that microdetails lead to macro-consequences, the summum being obtained with super-hydrophobic surfaces. We have explored various aspects of colloidal transport, and in particular the so-called diffusio-phoresis, i.e. motion of particles under solute (salt) gradients. Using the microfluidics technology, we have shown that this phenomenon, which bares some analogy with chemotaxis of biological entities, allows to harvest the chemical energy contained in solute contrasts to induce a strong migration of the particles. Beyond, we used this phenomenon to power chemically-driven active colloids, which self-propel using a chemical reaction at their surface. 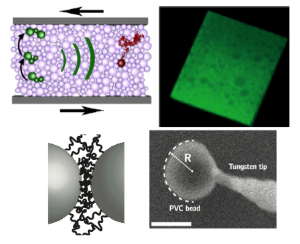 Most recently, we explored the behavior of magnetotactic bacteria which exhibit unexpected spatial patterns under flow. This opens the possibility to explore the phase behavior of active colloidal suspension, which exhibits new behaviors and phases. We explore the flow behavior of soft glassy materials, such as emulsions, gels,... which behave like solids at rest and flow under a sufficiently applied stress. We have demonstrated the existence of non-local/cooperativity effects in the rheology, a behavior which is accounted for by a non-local fluidity description, and justified on the basis of a mesoscopic Kinetic Elasto-Plastic (KEP) model that we developped. 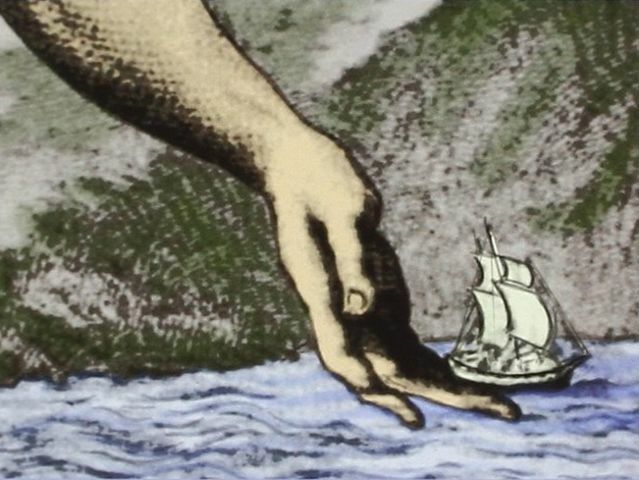 This phenomenology allows to rationalize most behaviors of such materials. 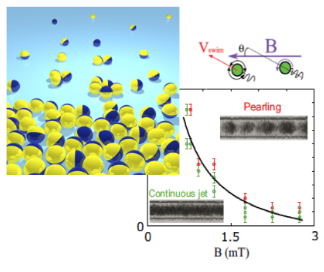 Recently we extended our interest to shear-thickening systems, showing how the nanoscale pairwise frictional properties between individual beads determinate the macroscopic shear-thickening behavior. I have a high interest and strong implication in physics of everyday life. 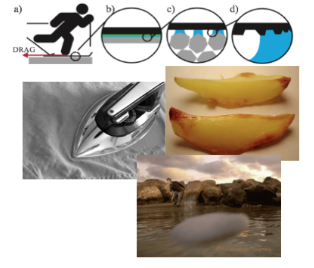 Examples are physics of stone-skipping, splashes, physics in the kitchen (ironing, cooking of potatoes, teapot effect, ...), based on fundamental physics applied to problems encountered in our everyday life. We are currently exploring the role of waxing on ski friction, in collaboration with the french biathlon team.